Before :- K. S. Radhakrishnan and Dipak Misra, JJ. Criminal Appeal No. 750 and 751 of 2012 (Arising out of S.L.P. (Criminal) No. 7281 and 7286 of 2011). D/d. 4.5.2012. For the Appellant :- Ms. Rekha Pandey, Ms. Ambika Das and Ms. Sailaja V., Advocates. For the Respondent :- Ms. Sandhya Goswami, M.P.S. Tomar, Jabar Singh, Jitendra Mohapatra, Chandra Bhushan Prasad and Syed Rehen, Advocates. JUDGMENTDipak Misra, J. - Leave granted in both the petitions. 2. "Liberty is to the collective body, what health is to every individual body. Without health no pleasure can be tasted by man; without Liberty, no happiness can be enjoyed by society." "Is life so dear, or peace so sweet, as to be purchased at the price of chains and slavery? Forbid it, Almighty God ! I know not what course others may take, but as for me, give me liberty, or give me death !" The thought of losing one's liberty immediately brings in a feeling of fear, a shiver in the spine, an anguish of terrible trauma, an uncontrollable agony, a penetrating nightmarish perplexity and above all a sense of vacuum withering the very essence of existence. It is because liberty is deep as eternity and deprivation of it, infernal. May be for this protectors of liberty ask, "How acquisition of entire wealth of the world would be of any consequence if one's soul is lost?" It has been quite often said that life without liberty is eyes without vision, ears without hearing power and mind without coherent thinking faculty. "Men are qualified for civil liberty, in exact proportion to their disposition to put moral chains upon their own appetites; in proportion as their love to justice is above their rapacity; in proportion as their soundness and sobriety of understanding is above their vanity and presumption; in proportion as they are more disposed to listen to the counsel of the wise and good, in preference to the flattery of knaves. Society cannot exist unless a controlling power upon will and appetite be placed somewhere and the less of it there is within, the more there must be without. It is ordained in the eternal constitution of things that men of intemperate minds cannot be free. Their passions forge their fetters." "In an ordered society of mankind there is no such thing as unrestricted liberty, either of nations or of individuals. Liberty itself is the product restraints; it is inherently a composite of restraints; it dies when restraints are withdrawn. Freedom, I say, is not an absence of restraints; it is a composite of restraints. There is no liberty without order. There is no order without systematized restraint. Restraints are the substance without which liberty does not exist. They are the essence of liberty. The great problem of the democratic process is not to strip men of restraints merely because 'they are restraints. The great problem is to design a system of restraints which will nurture the maximum development of man's capabilities, not in a massive globe of faceless animations but as a perfect realization, of each separate human mind, soul and body; not in mute, motionless meditation but in flashing, thrashing activity." 6. Keeping the cherished idea of liberty in mind, the fathers of our Constitution engrafted in its Preamble : "Liberty of thought, expression, belief, faith and worship." After a lot of debate in the Constituent Assembly, Article 21 of the Constitution came into existence in the present form laying down in categorical terms that no person shall be deprived of his life and personal liberty except according to the procedure established by law. 7. We have begun with the aforesaid prologue, as the seminal question that falls for consideration in these appeals is whether the High Court, despite the value attached to the concept of liberty, could afford to vaporise the statutory mandate enshrined under Section 438 of the Code of Criminal Procedure (for short 'the Code'). It is not to be forgotten that liberty is not an absolute abstract concept. True it is, individual liberty is a very significant aspect of human existence but it has to be guided and governed by law. Liberty is to be sustained and achieved when it sought to be taken away by permissible legal parameters. A court of law is required to be guided by the defined jurisdiction and not deal with matters being in the realm of sympathy or fancy. 8. Presently to the narration. In these two appeals arising out of SLP No. 7281 of 2011 and 7286 of 2011, the challenge is to the orders dated 22.07.2011 and 05.08.2011 in BLAPL No. 13036 of 2011 and 12975 of 2011 respectively passed by the High Court of Judicature of Orissa at Cuttack in respect of five accused persons under Section 438 of the Code pertaining to offences punishable under Section 341/294/506 and 302 read with Section 34 of the Indian Penal Code (for short "the IPC") in connection with Binjharpur PS Case No. 88/2011 corresponding to GR Case No. 343 of 2011 pending in the Court of learned SDJM, Jajpur. 9. The present appeals have been preferred by the sister of the deceased and the complainant, an eye witness, seeking quashing of the orders on the foundation that the High Court has extended the benefit of Section 438 (1) of the Code in an illegal and impermissible manner. 10. The facts that had formed the bedrock in setting the criminal law in motion need not be stated, for the nature of orders passed by High Court in both the cases have their own peculiarity. If we allow ourselves to say they have the enormous potentiality to create colossal puzzlement as regards the exercise of power under Section 438 of the Code. 11. While dealing with the case of accused Uttam Das and Ranjit Das, vide order dated 22.07.2011 the High Court, as stated, perused the case file and passed the following order. "Considering the facts and circumstances of the case and the materials available on record, this Court is not inclined to grant anticipatory bail to the petitioners. This court directs that if petitioner No. 1 Uttam Das surrenders before the learned S.D.J.M., Jajpur and moves an application for bai l in the aforesaid case, in such event the learned S.D.J.M. shall release him on bail on such terms and conditions as he may deem fit and proper. So far as petitioner No. 2 Ranjit Das is concerned, this court directs him to surrender before the learned S.D.J.M., Jajpur and move an application for bail in connection with the aforesaid case, in such event his application shall be considered by the learned S.D.J.M., on its own merits. The Bail Application is accordingly disposed of." 12. In the case of the other accused persons, namely, Abhimanyu Das, Murlidhar Patra and Bhagu Das the High Court on 05.08.2011 passed the order on following terms. "Considering the facts and circumstances of the case this Court is not inclined to grant anticipatory bail to the petitioners. Since there are some materials against Bhagu Das @ Sanjit Kumar Das petitioner No. 3, this Court directs that in case petitioner No. 3 surrenders before the leaned S.D.J.M., Jajpur and moves an application for bail, the learned S.D.J.M. shall consider and dispose of the same on its own merit in accordance with law. So far as the prayer for bail of petitioner Nos. 1 and 2 is concerned since one of the co accused namely, Uttam Das has been released on bail in pursuance of order dated 02.07.2011 passed by this Court in BLAPL No. 13036 of 2011 and petitioner Nos. 1 and 2 stands on similar footing with co- accused Uttam Das, this Court directs that in case petitioner Nos. 1 and 2 surrender before the learned S.D.J.M., Jajpur and move an application for bail, the learned S.D.J.M., shall release them on bail on such terms and conditions as he may deem fit and proper with further condition that petitioner Nos. 1 and 2 shall give an undertaking before the Court below that they will not commit any similar type of offence. In case any complaint is received against them that will amount to cancellation of bail"
13. On a perusal of both the orders it is perceivable that the commonality in both the orders is that while the High Court had expressed its opinion that though it is not inclined to grant anticipatory bail to the petitioners yet it has directed on their surrender some of the accused petitioners would be enlarged on bail on such terms and conditions as may be deemed fit and proper by the concerned Sub Divisional Judicial Magistrate and cases of certain accused persons on surrender shall be dealt with on their own merits. 14. The learned counsel for the petitioner has contended that the High Court has gravely flawed in passing such kind of orders in exercise of power under Section 438 of the Code which the law does not countenance and, therefore, they deserved to be lancinated. It is his further submission that when the accused persons are involved in such serious offences the High Court could not have dealt with them by taking recourse to an innovative method which has no sanction in law. 15. The learned counsel for the respondent made a very feeble attempt to support the orders. 16. The pivotal issue that emanates for consideration is whether the orders passed by the High Court are legitimately acceptable and legally sustainable within the ambit and sweep of Section 438 of the Code. To appreciate the defensibility of the order it is condign to refer to Section 438 of the Code which reads as follows. Provided that, where the High Court or, as the case may be, the Court of Session, has not passed any interim order under this sub-section or has rejected the application for grant of anticipatory bail, it shall be open to an officer incharge of a police station to arrest, without warrant the applicant on the basis of the accusation apprehended in such application. (3) If such person is thereafter arrested without warrant by an officer in charge of a police station on such accusation, and is prepared either at the time of arrest or at any time while in the custody of such officer to give bail, he shall be released on bail, and if a Magistrate taking cognizance of such offence decides that a warrant should issue in the first instance against that person, he shall issue a bailable warrant in conformity with the direction of the court under sub-section (1)." 17. The aforesaid provision in its denotative compass and connotative expanse enables one to apply and submit an application for bail where one anticipates his arrest in a non-bailable offence. Though the provision does not use the expression anticipatory bail, yet the same has come in vogue by general usage and also has gained acceptation in the legal world. 18. The Constitution Bench in Gurbaksh Singh Sibbia etc. v. The State of Punjab, AIR 1980 SC 1632, has drawn a distinction between an order of ordinary bail and order of anticipatory bail by stating that the former is granted when the accused is in custody and, therefore, means release from the custody of the Police, and the latter is granted in anticipation of arrest and hence, effective at the very moment of arrest. It has been held therein, an order of anticipatory bail constitutes, so to say, an insurance against Police custody falling upon arrest for offences in respect of which the order is issued. Their Lordships clarifying the distinction have observed that unlike a post- arrest order of bail, it is a prearrest legal process which directs that if the person in whose favour it is issued is thereafter arrested on the accusation in respect of which the direction is issued, he shall be released on bail. "We agree, with respect, that the power conferred by Section 438 is of an extraordinary character in the sense indicated above, namely, that it is not ordinarily resorted to like the power conferred by Sections 437 and 439. We also agree that the power to grant anticipatory bail should be exercised with due care and circumspection." 20. Thereafter, the larger Bench referred to the concept of liberty engrafted in Article 21 of the Constitution, situational and circumstantial differences from case to case and observed that in regard to anticipatory bail, if the proposed accusation appears to stem not from motives of furthering the ends of justice but from some ulterior motive, the object being to injure and humiliate the applicant by having him arrested, a direction for the release of the applicant on bail in the event of his arrest would generally be made. On the other hand, if it appears likely, considering the antecedents of the applicant, that taking advantage of the order of anticipatory bail he will flee from justice, such an order would not be made. However, it cannot be laid down as an inexorable rule that anticipatory bail cannot be granted unless the proposed accusation appears to be actuated by mala fides; and equally, that anticipatory bail must be granted if there is no fear that the applicant will abscond. The Constitution Bench also opined the Court has to take into consideration the combined effect of several other considerations which are too numerous to enumerate and the legislature has endowed the responsibility on the High Court and the Court of Session because of their experience. "Exercise of jurisdiction under Section 438 of Code of Criminal Procedure is extremely important judicial function of a judge and must be entrusted to judicial officers with some experience and good track record. Both individual and society have vital interest in orders passed by the courts in anticipatory bail applications." "(i) Before power under Sub-section (1) of Section 438 of the Code is exercised, the Court must be satisfied that the applicant invoking the provision has reason to believe that he is likely to be arrested for a non- bailable offence and that belief must be founded on reasonable grounds. Mere "fear" is not belief, for which reason, it is not enough for the applicant to show that he has some sort of vague apprehension that some one is going to make an accusation against him, in pursuance of which he may be arrested. The grounds on which the belief of the applicant is based that he may be arrested for a non-bailable offence, must be capable of being examined by the Court objectively. Specific events and facts must be disclosed by the applicant in order to enable the Court to judge of the reasonableness of his belief, the existence of which is the sine qua non of the exercise of power conferred by the Section. (ii) The provisions of Section 438 cannot be invoked after the arrest of the accused. After arrest, the accused must seek his remedy under Section 437 or Section 439 of the Code, if he wants to be released on bail in respect of the offence or offences for which he is arrested. (viii) An interim bail order can be passed under Section 438 of the Code without notice to the Public Prosecutor but notice should be issued to the Public Prosecutor or to the Government advocate forthwith and the question of bail should be re-examined in the light of respective contentions of the parties. The adinterim order too must conform to the requirements of the Section and suitable conditions should be imposed on the applicant even at that stage." 23. At this juncture we may note with profit that there was some departure in certain decisions after the Constitution Bench decision. In Salauddin Abdulsamad Shaikh v. State of Maharashta, 1998(2) R.C.R. (Criminal) 96 : AIR 1996 SC 1042, it was held that it was necessary that under certain circumstances anticipatory bail order should be of a limited duration only and ordinarily on the expiry of that duration or extended duration the Court granting anticipatory bail should leave it to the regular court to deal with the matter on appreciation of material placed before it. 24. In K.L. Verma v. State and Anr., 1997(1) R.C.R. (Criminal) 493 : (1998)9 SCC 348, it was ruled that limited duration must be determined having regard to the facts of the case and the need to give the accused sufficient time to move the court for regular bail and to give the regular court sufficient time to determine the bail application. It was further observed therein that till the bail application is disposed of one way or the other, the Court may allow the accused to remain on anticipatory bail. 25. In Nirmal Jeet Kaur v. State of M. P. and Another, 2004(4) R.C.R. (Criminal) 376 : 2004(3) Apex Criminal 557 : (2004)7 SCC 558, the decision in K.L. Verma's case (supra) was clarified by stating that the benefit of anticipatory bail may be extended few days thereafter to enable the accused persons to move the High Court if they so desire. 26. In Adri Dharan Das v. State of West Bengal, 2005(2) R.C.R. (Criminal) 32 : 2005(1) Apex Criminal 473 : (2005)4 SCC 303, a two-Judge Bench while accepting for grant of bail for limited duration has held that arrest is a part of the process of investigation intended to secure several purposes. The accused may have to be questioned in detail regarding various facets of motive, preparation, commission and aftermath of the crime and the connection of other persons, if any, in the crime. There may be circumstances in which the accused may provide information leading to discovery of material facts. It may be necessary to curtail his freedom in order to enable the investigation to proceed without hindrance and to protect witnesses and persons connected with the victim of the crime, to prevent his disappearance to maintain law and order in the locality. For these or other reasons, arrest may become inevitable part of the process of investigation. The legality of the proposed arrest cannot be gone into in an application under Section 438 of the Code. The role of the investigator is well-defined and the jurisdictional scope of interference by the Court in the process of investigation is limited. The Court ordinarily will not interfere with the investigation of a crime or with the arrest of accused in a cognizable offence. An interim order restraining arrest, if passed while dealing with an application under Section 438 of the Code will amount to interference in the investigation, which cannot, at any rate, be done under Section 438 of the Code. "14. After analyzing the crucial question is when a person is in custody, within the meaning of Section 439 of the Code, it was held in Nirma l Jeet Kaur's case (supra) and Sunita Devi's case (supra) that for making an application under Section 439 the fundamental requirement is that the accused should be in custody. As observed in Salauddin's case (supra) the protection in terms of Section 438 is for a limited duration during which the regular Court has to be moved for bail. Obviously, such bail is bail in terms of Section 439 of the Code, mandating the applicant to be in custody. Otherwise, the distinction between orders under Sections 438 and 439 shall be rendered meaningless and redundant. 15. If the protective umbrella of Section 438 is extended beyond what was laid down in Salauddin's case (supra) the result would be clear bypassing of what is mandated in Section 439 regarding custody. In other words, till the applicant avails remedies up to higher Courts, the requirements of Section 439 become dead letter. No part of a statute can be rendered redundant in that manner." "In our judgment, on the facts and in the circumstances of the present case, neither of the above directions can be said to be legal, valid or in consonance with law. Firstly, the order passed by the High Court is a blanket one as held by the Constitution Bench of this Court in Gurbaksh Singh and seeks to grant protection to respondents in respect of any non-bailable offence. Secondly, it illegally obstructs, interferes and curtails the authority of Custom Officers from exercising statutory power of arrest a person said to have committed a non-bailable offence by imposing a condition of giving ten days prior notice, a condition not warranted by law. The order passed by the High Court to the extent of directions issued to the Custom Authorities is, therefore, liable to be set aside and is hereby set aside." 29. Be it noted, the principle of grant of anticipatory bail for a limited duration in cases of Salauddin Abdulsamad Shaikh (supra), K.L. Verma (supra), Adri Dharan Das (supra), Sunita Devi v. State of Bihar & Anr., 2005(1) R.C.R. (Criminal) 410 : 2005(1) Apex Criminal 244 : (2005)1 SCC 608 was held to be contrary to the Constitution decision in Gurbaksh Singh Sibbia's case (supra) by a two-Judge Bench in Siddharam Satlingappa Mhetre v. State of Maharashtra and Ors., 2011(1) R.C.R. (Criminal) 126 : 2010(6) Recent Apex Judgments (R.A.J.) 581 : (2011)1 SCC 694 and accordingly the said decisions were treated as per incurium. It is worth noting though the Bench treated Adri Dharan Das (supra) to be per incuriam, as far as it pertained to grant of anticipatory bail for limited duration, yet it has not held that the view expressed therein that the earlier decisions pertaining to the concept of deemed custody as laid down in Salauddin Abdulsamad Shaikh (supra) and similar line of cases was per incuriam. It is so as the introversy involved in Siddharam Satlingappa Mhetre (supra) did not relate to the said arena. 30. We have referred to the aforesaid pronouncements to highlight how the Constitution Bench in the case of Gurbaksh Singh Sibbia (supra) had analysed and explained the intrinsic underlying concepts under Section 438 of the Code, the nature of orders to be passed while conferring the said privilege, the conditions that are imposable and the discretions to be used by the courts. On a reading of the said authoritative pronouncement and the principles that have been culled out in Savitri Agarwal (supra) there is remotely no indication that the Court of Session or the High Court can pass an order that on surrendering of the accused before the Magistrate he shall be released on bail on such terms and conditions as the learned Magistrate may deem fit and proper or the superior court would impose conditions for grant of bail on such surrender. When the High Court in categorical terms has expressed the view that it not inclined to grant anticipatory bail to the accused petitioners it could not have issued such a direction which would tantamount to conferment of benefit by which the accused would be in a position to avoid arrest. It is in clear violation of the language employed in the statutory provision and in flagrant violation of the dictum laid down in the case of Gurbaksh Singh Sibbia (supra) and the principles culled out in the case of Savitri Agarwal (supra). It is clear as crystal the court cannot issue a blanket order restraining arrest and it can only issue an interim order and the interim order must also conform to the requirement of the section and suitable conditions should be imposed. In the case of Gurbaksh Singh Sibbia (supra) the Constitution Bench has clearly observed that exercise of jurisdiction under Section 438 of the Code is an extremely important judicial function of a judge and both individual and society have vital interest in the orders passed by the court in anticipatory bail applications. 31. In this context it is profitable to refer to a three-Judge Bench decision in Dr. Narendra K. Amin v. State of Gujarat and another, 2008(2) R.C.R. (Criminal) 858 : 2008(3) R.A.J. 339 : 2008 (6) SCALE 415. In the said case a learned Judge of the Gujarat High Court cancelled the bail granted to the appellant therein in exercise of power under Section 439(2) of the Code. It was contended before this Court that the High Court had completely erred by not properly appreciating the distinction between the parameters for grant of bail and cancellation of bail. 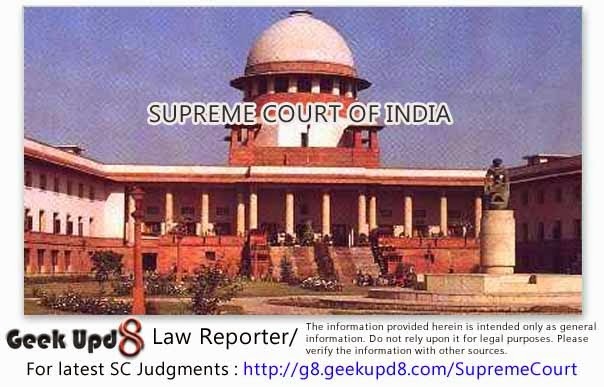 The Bench referred to the decision in Puran v. Rambilas and another, 2001(2) R.C.R. (Criminal) 801 : (2001)6 SCC 338 wherein it has been noted that the concept of setting aside an unjustified, illegal or perverse order is totally different from the cancelling an order of bail on the ground that the accused has misconducted himself or because of some supervening circumstances warranting such cancellation. The three-Judge Bench further observed that when irrelevant materials have been taken into consideration the same makes the order granting bail vulnerable. In essence, the three-Judge Bench has opined that if the order is perverse, the same can be set at naught by the superior court. In the case at hand the direction to admit the accused persons to bail on their surrendering has no sanction in law and, in fact, creates a dent in the sacrosanctity of law. It is contradictory in terms and law does not countenance paradoxes. It gains respectability and acceptability when its solemnity is maintained. Passing such kind of orders the interest of the collective at large and that of the individual victims is jeopardised. That apart, it curtails the power of the regular court dealing with the bail applications. 32. In this regard it is to be borne in mind that a court of law has to act within the statutory command and not deviate from it. It is a well settled proposition of law what cannot be done directly, cannot be done indirectly. While exercising a statutory power a court is bound to act within the four corners thereof. The statutory exercise of power stands on a different footing than exercise of power of judicial review. This has been so stated in Bay Berry Apartments (P) Ltd. and Anr. v. Shobha and Ors., (2006)13 SCC 737 and U.P. State Brassware Corporation Ltd. and Anr. v. Uday Narain Pandey, 2006(1) S.C.T. 77 : (2006)1 SCC 479. 33. Judging on the foundation of aforesaid well settled principles, the irresistible conclusion is that the impugned orders directing enlargement of bail of the accused persons, namely, Uttam Das, Abhimanyu Das and Murlidhar Patra by the Magistrate on their surrendering are wholly unsustainable and bound to founder and accordingly the said directions are set aside. Consequently the bail bonds of the aforenamed accused persons are cancelled and they shall be taken into custody forthwith. It needs no special emphasis to state that they are entitled to move applications for grant of bail under Section 439 of the Code which shall be considered on their own merits. 34. The appeals are accordingly disposed of.